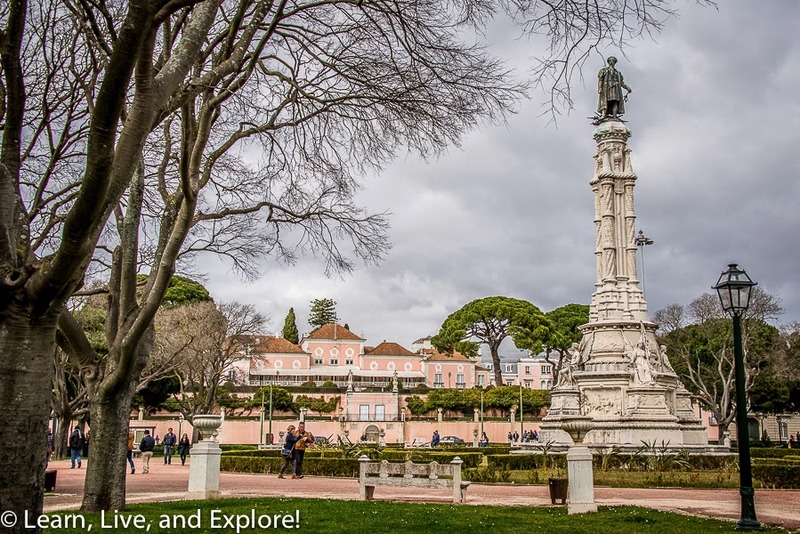 24 Hours in Lisboa (Lisbon), Portugal ~ Learn, Live, and Explore! 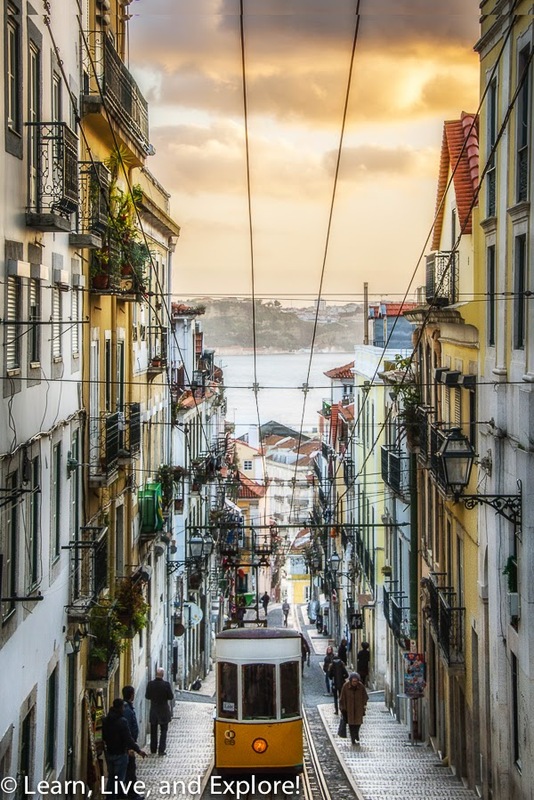 Unlike other major cities in Europe with hundreds of years of history preserved in its buildings and attractions, the majority of Lisbon's history begins after the great earthquake of 1755, when a large portion of the city was leveled and thousands of people were killed trying to escape the fires in the city by going to the river, not knowing that a tsunami awaited their arrival. 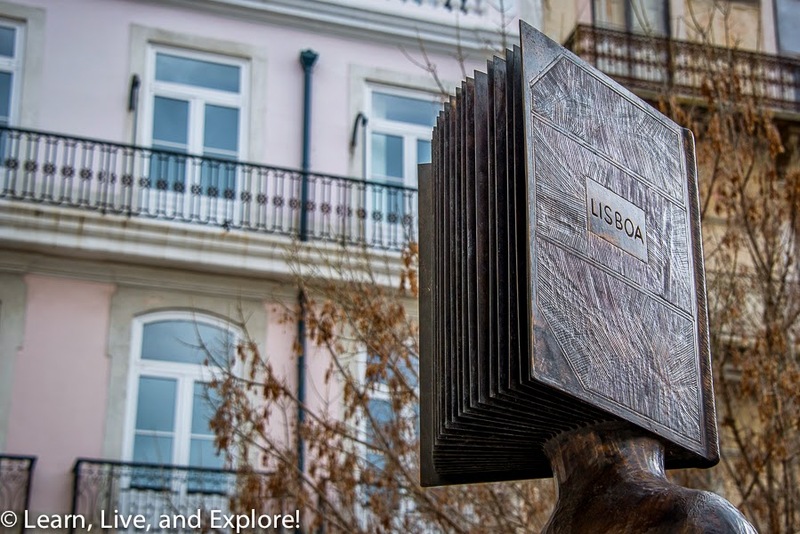 With a short amount of time in the city of Lisbon, I wanted to make the most of it. The first thing I do whenever I am in a major European city is to see if there is a free walking tour. I prefer the Sandeman's New Europe tours because they have been consistently great, and I wasn't let down in Lisbon. We met our English-speaking guide, Francisco, at the Largo de Camões square. 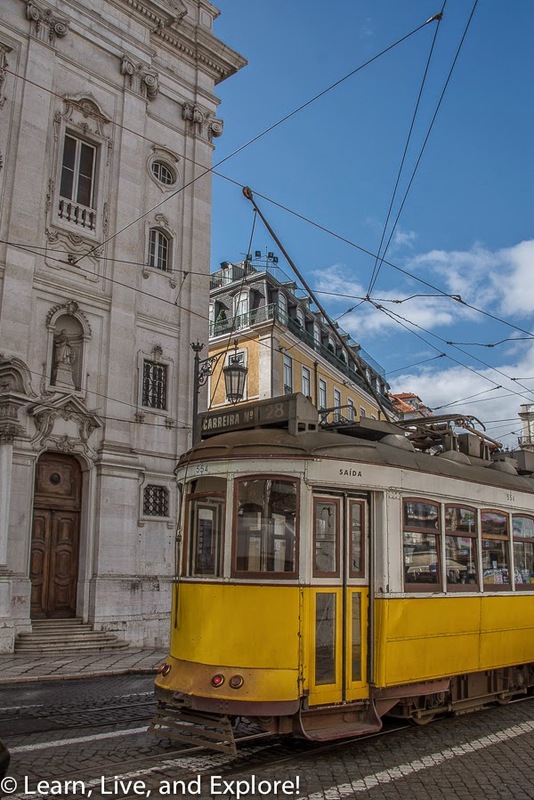 I was excited to get my first, of many, peeks at the famous Lisbon trolleys. Trolley cars are one of my favorite forms of transportation because they literally take you on a ride through history. Plus, they make great subjects for photos! After some introductions about Lisbon's history by Francisco, the group crossed over to the Barrio Alto and Largo do Chiado, where we stopped in front of one of the oldest cafés in Lisbon - Café A Brasileira. This was the place to go to get a "bica," or espresso drink in Portuguese. The origins of the term "bica" have been suggested to be based on the Arabica coffee bean, or "bica" for short, but it more likely refers to the time when Portuguese were trying to find a way to tolerate the bitterness of the new drink. To offset the strong taste of the espresso, it was marketed such that it should be consumed with sugar. In Portuguese, that translates to "bebe isto com açúcar" or "bica" for short. 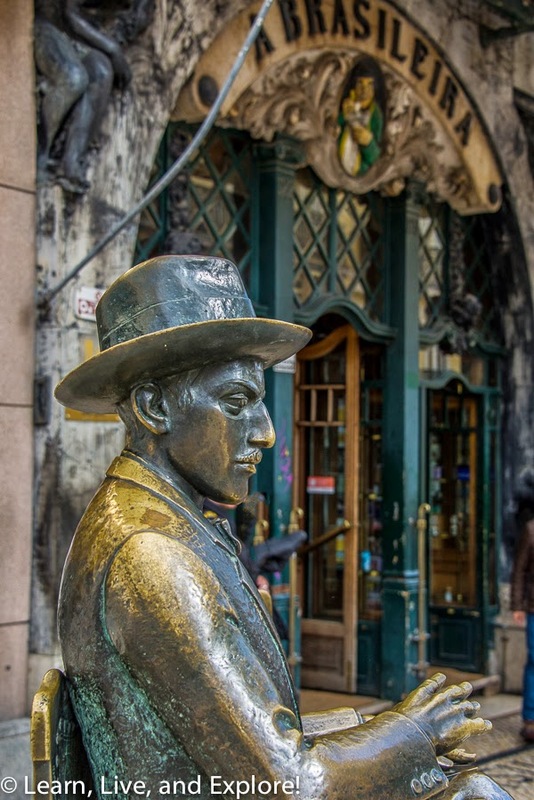 A bronze statue of Fernando Pessoa sits in front of the café. Pessoa, one of the greatest Portuguese poets, was a frequent customer of the café during his lifetime. 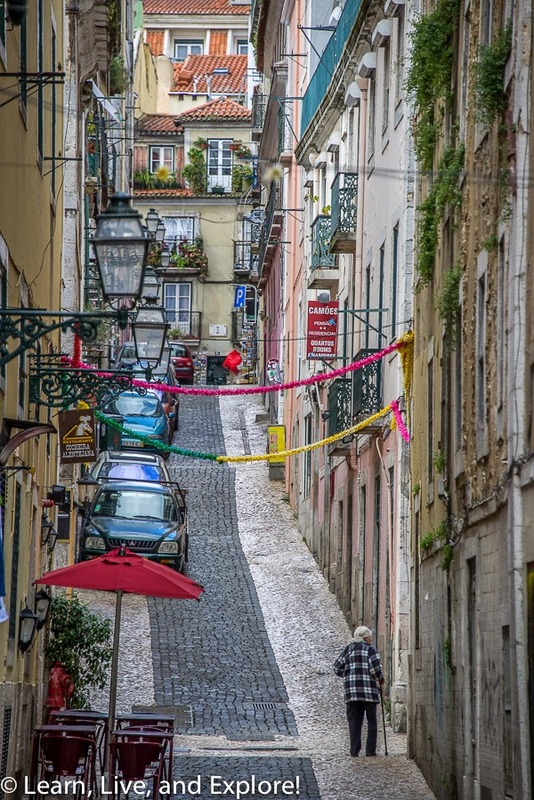 Lisbon is full of beautiful surprises around every corner. 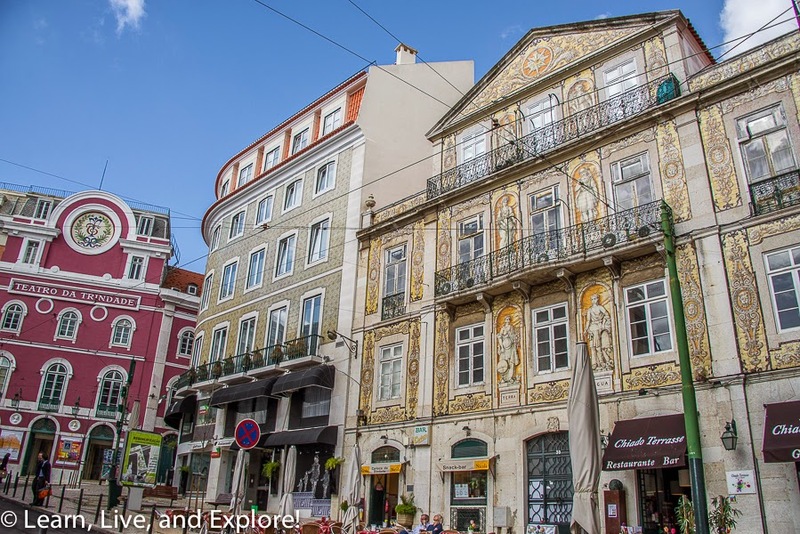 The facades of the buildings are often painted or tiled in gorgeous colors and designs. This is a town that encourages you to explore, despite its hills, and to keep your eyes open to everything around and above you. There are a few funiculars in the city that help to ease the pain of inevitably walking up the hills. As you can see, the street artists have found the funicular cars to be a great canvas. While this makes for a colorful photo, it makes my heart ache for the beautiful old car. 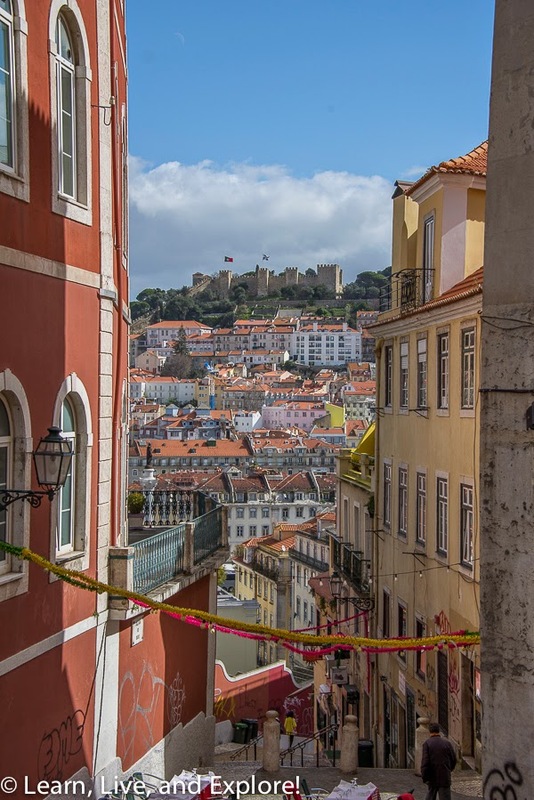 From the historic district, you can often glimpse the Castelo de São Jorge atop its hill. Time constraints prevented me from visiting the Moorish castle, that dates back to medieval times. This funicular photo is my favorite from my day in Lisbon, as it perfectly captured the "evening rush hour" with the sun setting on the Tagus River. 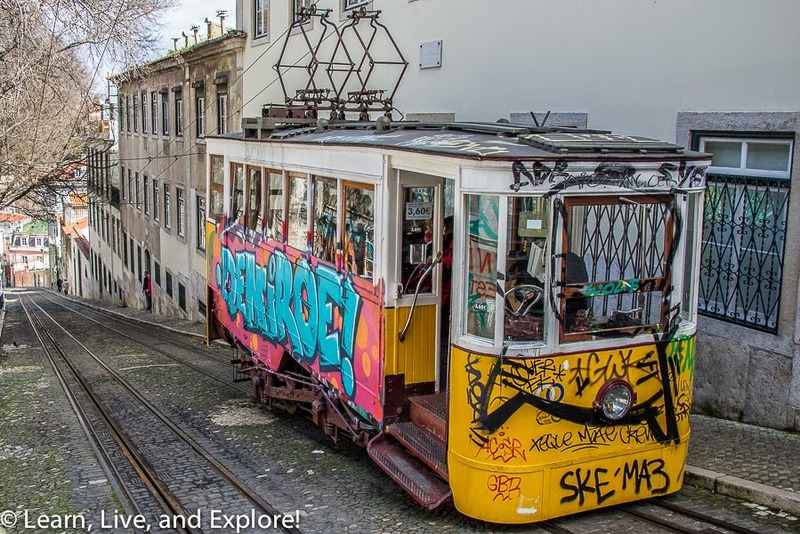 The location of this Bica Funicular photo op, is on Calçada do Combro, just west of the Largo de Camões square where the walking tour began. Since the free walking tour started at 11am, the company offered another afternoon tour paid option. I was there on the day when the afternoon tour explored the neighborhood of Belém (pronounced Beh-laym). We met at the same spot where the free tour ended, then went to the train station to catch a local train out a few stops. 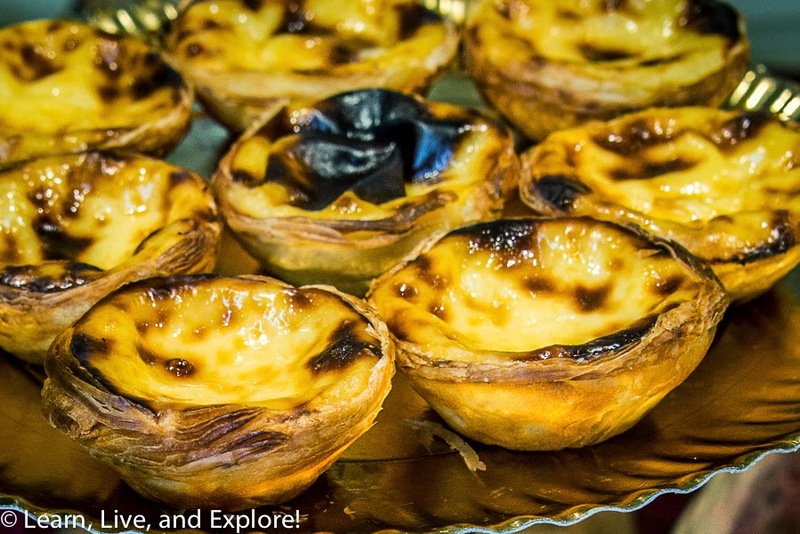 One of the primary attractions of the riverside Belém neighborhood is the Pastéis de Belém bakery. 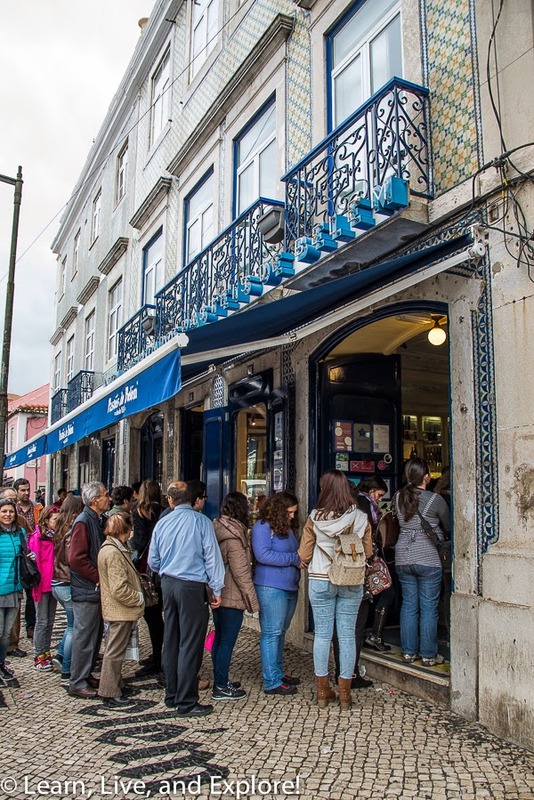 With a queue of as much as one hour, people wait their turn to purchase an infamous cream-filled pastry based on a super secret recipe. Others have tried to copy the delicious dessert, but have not created an exact match to the flavor profile. 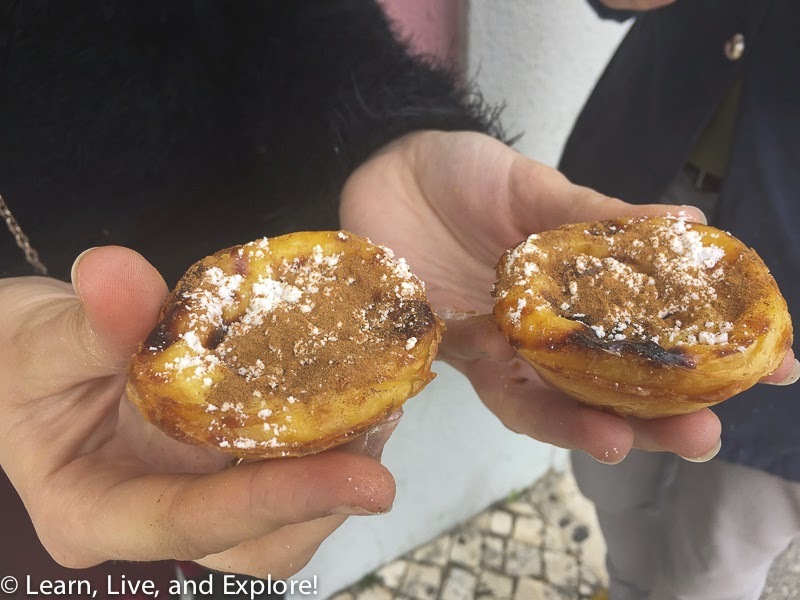 These copies you will see marketed as Pastéis de Nata because, like champagne vs. sparkling wine, only Pastéis de Belém can be from this location. When you finally reach the counter, they will offer you cinnamon and powdered sugar packets. The best way to eat these custard treats is warm and sprinkled with the cinnamon and sugar! 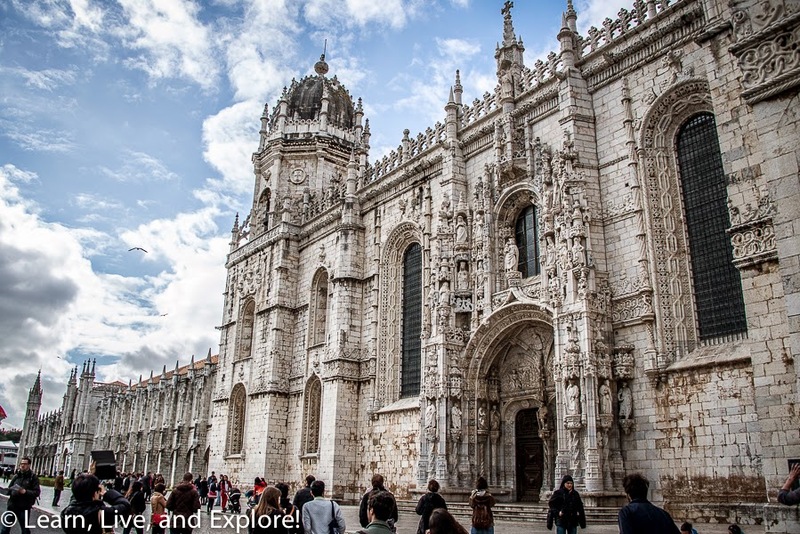 Near the bakery is Belém's other popular attraction, the Mosteiro dos Jerónimos. The Portuguese late gothic, or manueline, design monastery dates back to the 16th century. 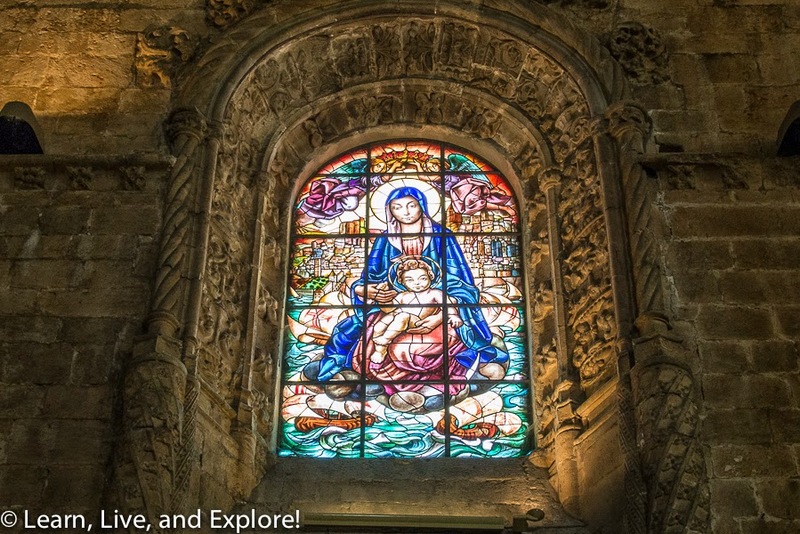 Inside the cathedral, there are many references to the Portuguese maritime history, like the stained glass window below. 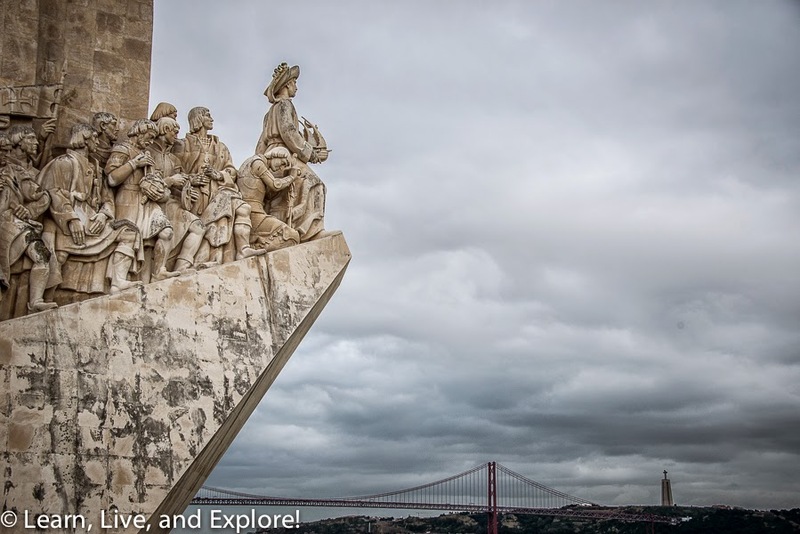 Along the waterfront, you can't miss the Padrão dos Descobrimentos, or the Monument to the Discoveries. This monument is dedicated to all of the men who were devoted to the exploration of the world during the Age of Discovery. Finally, down from the monument is Belém Tower. 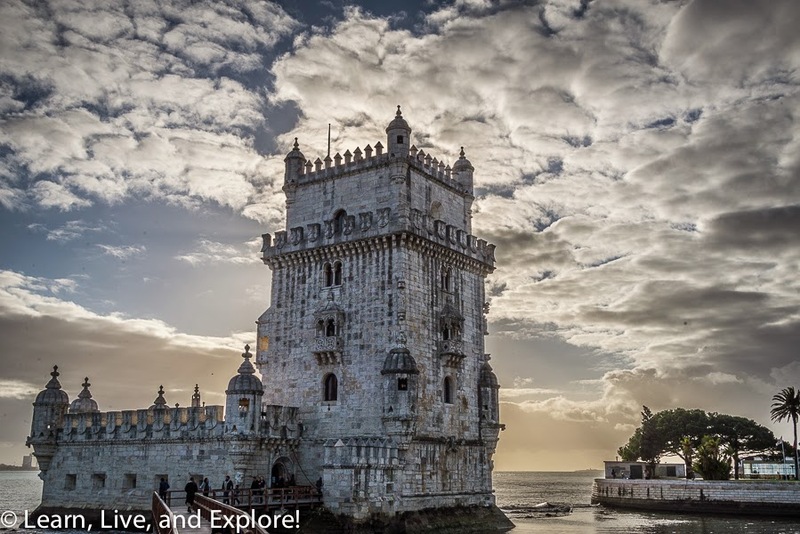 This 16th century structure is what remains of two original towers on opposite banks of the river that served not only defensive purposes, positioned at the mouth of the Tagus, but was a welcoming gateway to the city of Lisbon. Much like its neighboring monastery, it was built in the Portuguese late gothic, manueline style. The tower concluded the second tour of the day, aside from the train ride back into the main historic section of the city. 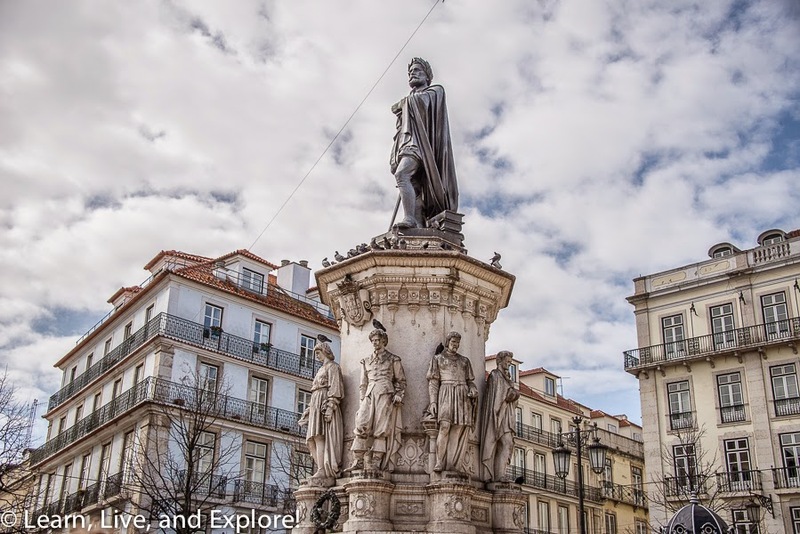 I found that accommodations near Largo de Camões were the most convenient to exploring the city in a short amount of time. In addition, if you still have energy, it was perfectly situated next to the nightlife area located north of Largo de Camões. Ask your tour guide for good suggestions on where to see a traditional Portuguese fado performance.